During the last five years of World War Two, the Japanese Imperial Navy made use of the technologically advanced Mitsubishi A6M "Zero" fighter. This finely detailed papercraft diorama designed by Masahiro Hisashi depicts a Zero at an airbase complete with concrete storage bunker and fuel truck. The papercraft templates for all models pictured may be downloaded here. Also available for download is a "weathered" version of the aircraft. 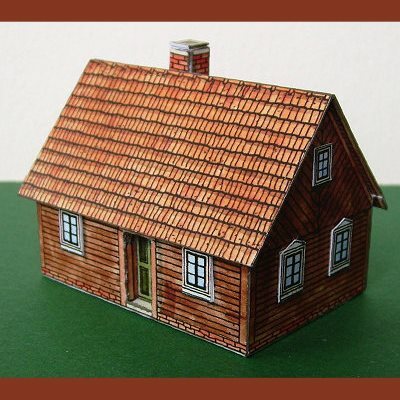 I don't know much about this 1:160 scale papercraft house, but I like it. :) Here's what I do know: the house was created by German designer Christian Meyertöns and the title of the papercraft is "Spreewaldhaus". I assume the name of the house means it is the kind of traditional house that may be found in the Spreewald area of the State of Brandenburg, Germany. The template for the house (which is hand drawn) may be downloaded here. The style of this model reminds me a lot of the work of Richard Vyškovský, the Czech architect who designed paper models in the 70's and 80's. 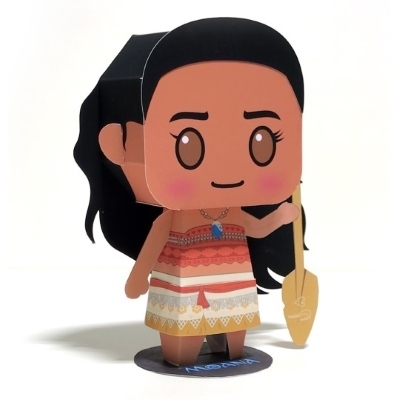 This paper toy of Disney's Moana was created by the Korean website "PopPaper". Moana is a Polynesian princess who goes on an ocean journey to find a way to save her island from a terrible blight (thus the oar in the paper toy's hand). She is accompanied on her quest by a Polynesian demigod known as Maui. The printable template for this paper toy may be downloaded here. (Look for the small green "1" in the upper right corner. Click on the 1 to activate the drop down, then click on the line of text with "PC" in the middle to download.) Moana was released in theaters in 2016. 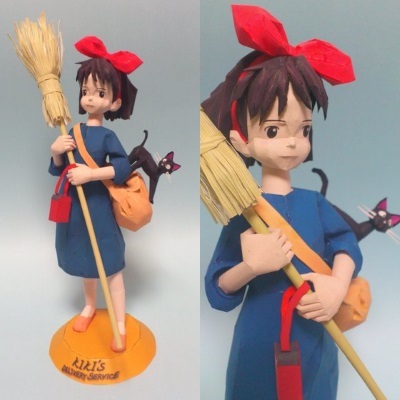 Kiki and her cat Jiji are the primary characters in the Studio Ghibli animated film, Kiki's Delivery Service. The movie follows the exploits of Kiki, a young witch in training who uses her flying broom to make deliveries. This nicely detailed paper model of Kiki and Jiji was created by kujiracraft. The Pepakura PDO template for the model may be downloaded here. Kiki's Delivery Service was released in Japan in 1989. An aerosani, in basic terms, is a propeller driven snowmobile. 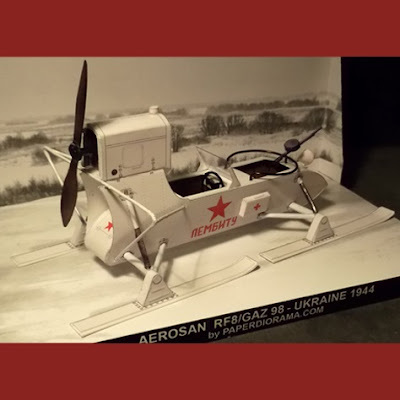 During World War II, the Soviet Union produced a military aerosani with the designation "RF-8/GAZ-98". It was a two man craft designed for reconnaissance missions in northern climates. The driver of the vehicle sat in the rear, while a machine gunner sat in front. 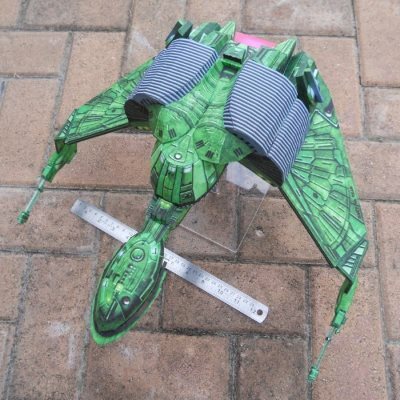 This 1:35 scale paper model of the RF-8 was designed by paperdiorama.com. A free printable PDF template for the model may be downloaded here. 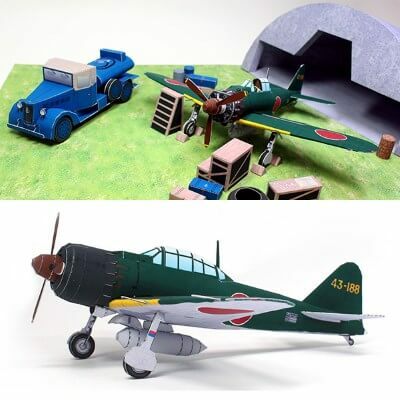 At Tektonten Papercraft you will find free papercraft designed by the blog's author, links to free printable paper models, as well as info on all types of paper constructions including: paper toys, dioramas, pop-ups, and origami. Enjoy your visit! Copyright © 2008 - 2019 Tektonten Papercraft. All Rights Reserved. Theme images by Ollustrator. Powered by Blogger.